Beautiful dress with white lace bodice and dark almond satin floor length skirt worn once. Corset style back makes the dress exceptionally comfortable and felt lovely and tailored. 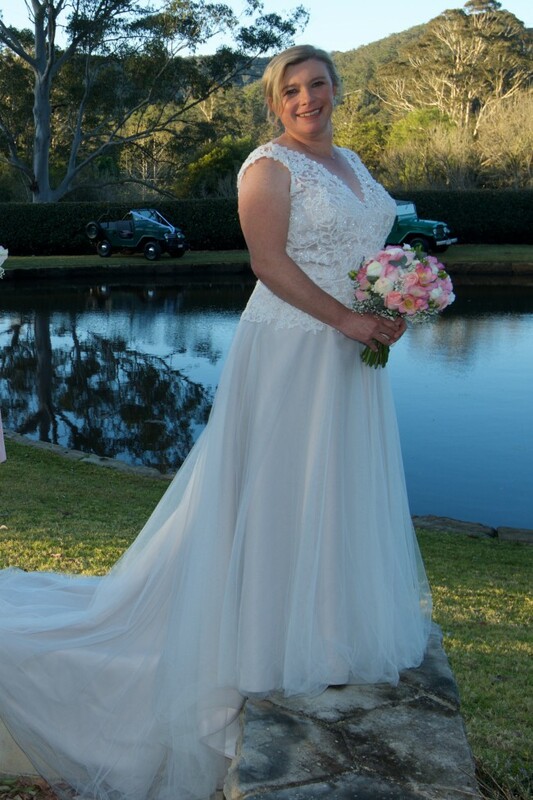 It is a cliche but I felt like a princess and it was amazingly comfortable to wear. It is a waste for this dress to sit in a box and I would love someone else to enjoy wearing it as much as I did. The skirt can be ironed to remove creases. The dress is part of the Only You bridal collection by Jean Fox ('Hope'). The dress was altered slightly to fit me with small tweaks in the sleeves and bust. And the length was altered with hooks added to carry the train. The dress has been dry-cleaned and is in extremely good condition with the exception of slight marking along the inside of the bust. There are no marks on the exterior of the dress. I have included a couple of photos showing the dress with alterations, and after dry-cleaning.